Hello, and welcome, to Goblin Encounters. Goblins are a staple of fantasy, being the encounter fodder for Dungeons and Dragons and showing up in games and movies constantly. So, I figured I would implement them into the game in a bit of a fun way. Goblin Grunts are the basic Goblin. Goblin Warriors wear crude armor and are slightly beefier. Goblin Monks are the religious leaders, praising the holy lapis and shooting you with burning goo. Goblin Rangers spawn in Towers and shoot you. Crude Golems are the Goblin's attempt to counter the Iron Golems of the Testificates (to little avail). And finally, there is the Goblin King, a fierce boss on par with the Wither in terms of challenge. Goblins all have strange quirks, for example, Grunts and Monks are obsessed with bats, watching them, chasing them, and if the bat isn't quick, killing them. Rangers have grown a fondness for chicken however (after all, bats are the chickens of the cave). Goblins are also, understandably, terrified of Iron Golems. And, the yall worship Lapis. 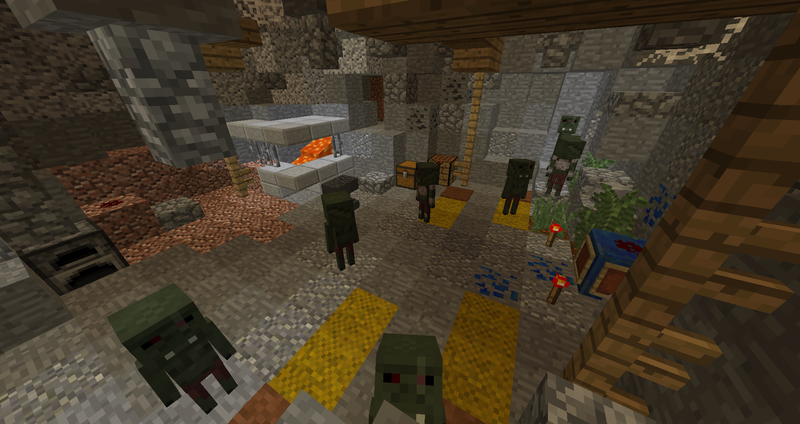 The Goblin Cave spawns underground with several goblins inside. This is not a walk in the park however. While frail alone, in numbers their speed and pack mentality are powerful. Even in full iron they can rip you to shreds if you get cocky. The Goblin Tower is a watch tower building where Goblins conduct their raid planning, in theory, though they tend to be lazy, lounging about and overeating on chicken. The Goblin Farm is a small structure, a simply hut with an attached pen where the goblins raise some pigs. There is little of value here, and few goblins to challenge your sword. The Goblin Raid is a randomly generated structure you may find in the plains from time to time, where several goblins and their Crude Golems are escorting a small cart back to their tower. The Goblin hall is a long mead hall the Goblins have stolen from the villagers and are using to store loot and to shelter from the elements. Storm in and slay the golems and the grunts to steal back some goodies. Finally, The Goblin Shrine. This structure spawns with four Monks around it, a decent danger given their ranged abilities. In the center, you will find a lapis block, a Silsipis Ore, and a Ritual Stone. Right clicking the Ritual Stone will summon the Goblin King and two Crude Golem bodyguards. The Goblin King is a hefty bloke, in size and health, but don't let that fool you, he is as speedy as his smaller minions. Slaying him will be a challenge requiring trickery or exceptionally good gear- full diamond with a few enchants at the least. On death he explodes into a shower of XP and you can pillage the Shrine for the Silsipis and Lapis. Wait, what else does this add? Well, quite a few things. To begin with, the reward for conquering the Shrine is a single Silsipis Crystal. This can be used to craft "Silsiphear The Goblin's Bane", blade worthy of such a fight. It spawns pre-enchanted with Fire Aspect, Smite, and Sweeping, and does a base damage of 10, making it a mighty blade indeed. You can also create a saddle, smelt rotten flesh into leather, combine a sugar and a wheat for a low-tier 'Ration Cake' food, and gather Goblinsbane flowers to craft purple dye, no longer needing to combine lapis and bone meal to get it. On top of all that, there is a new dry desert-like biome, the Drylands, which generates with a dark dry brown biome color with no lakes. There is also a new decorative block, called a crate, which serves no function but looks nice and has sound effects attached. When you right click it it sounds like when you open a chest, and when you break it it makes a loud banging noise. You can also make "Mail", or chain links, which can be crafted into Chainmail Armor, finally adding that properly into the game. Check out the PMC Page for Recipe Images.